The Combi HL-350 SA horizontal case loader is offered as a semi-automatic or fully automatic side load case packing system. Integrated with our E-series case erectors, the HL is an excellent system for a diverse range of products, accommodating a wide range of case sizes and pack patterns on the same machine. The HL-350 SA case loader features simple modular design and few change parts, assuring fast changeovers and minimal downtime. The HL-350SA semi-automatic case loading system allows one worker to attend many case loaders, and other tasks on the line. Cases are manually erected prior to automated packaging. The higher speed HL-350 SA horizontal case loader provides flexibility by opening, loading and sealing a case that is lying horizontally. 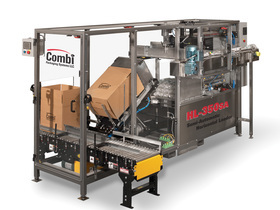 This automated packaging system is integrated with the Combi HCE case erector and features a case sealer equipped with your choice of pressure sensitive tape or hot melt glue.